This truly one of a kind suite, The MG Suite at Gambaro Hotel Brisbane, epitomises the hotel’s essence of modern luxury, superior service and ultra-cool comfort. As you enter through the double-doors, you’ll be immersed into a superb open-plan lounge room retreat, where elegance and luxury abound. An ideal spot for entertaining or relaxation, this space features state of the art technology, and separate desk area. The warm, rich tones of the bespoke furniture and furnishings complement the view offered as a backdrop through expansive floor to ceiling glass. 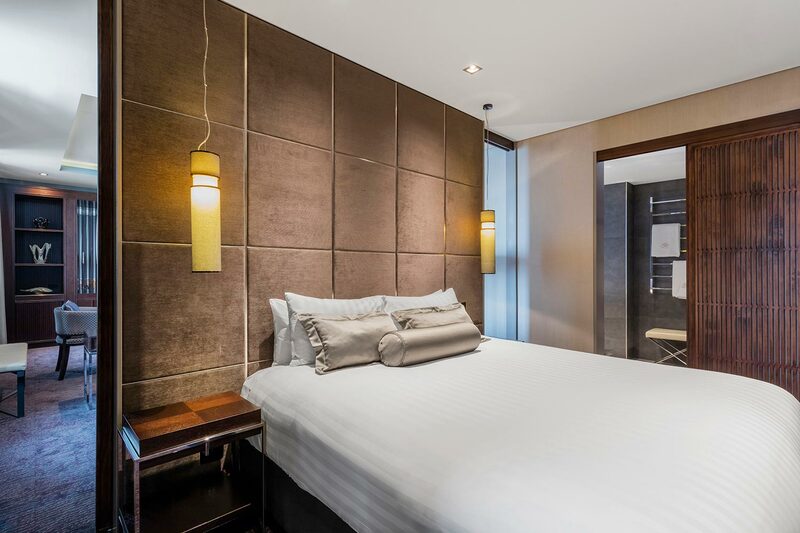 Tucked behind the spacious lounge-room, you’ll find a luxurious, modern bedroom offering privacy and an invitingly intimate atmosphere. 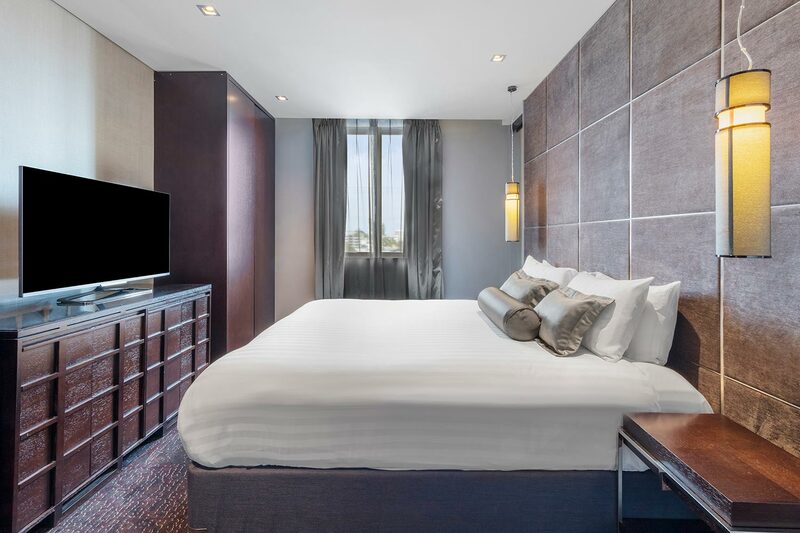 Relax and recharge with a second Philips Media Suite 55″ LED TV and the ultra premium Sealy Exquisite Collection King bed, the most luxurious bed supplied by Sealy to a hotel in Australia – exclusive to Gambaro Hotel Brisbane. Two-door access is provided to the superb bathroom, from either the bedroom or the lounge-room. His and her marble vanities, a huge rainfall shower, deep soaking tub, bathroom amenities by MOR, and separate dressing/makeup area amplify the glamorous and alluring surrounds. The MG suite embodies the unique Gambaro experience, and is ideal for special event stays. 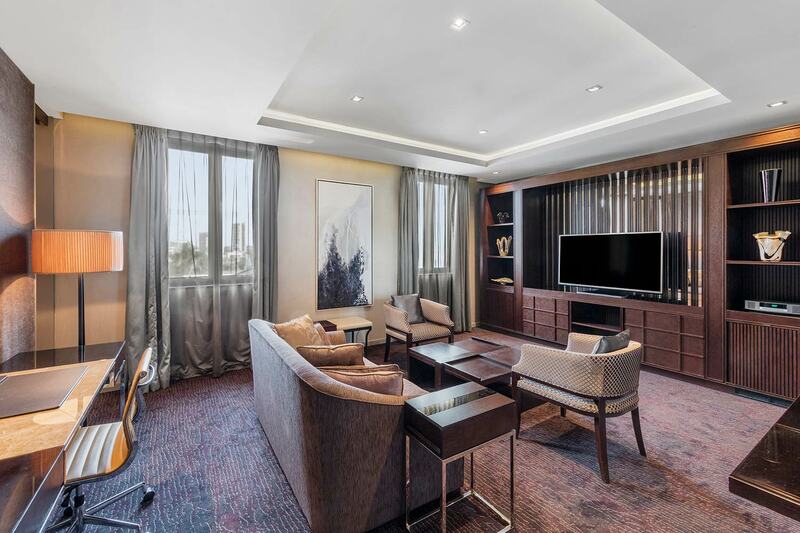 The MG Suite can be interconnected with a Paddington King Room, and both rooms combined to create a 2-bedroom Signature Suites with exclusive private access. Please contact the Hotel team for further information.